ST. PUCCHIGloves, or No Gloves? One of the questions I am asked very often is whether gloves are in vogue or not, and when are they appropriate to wear. 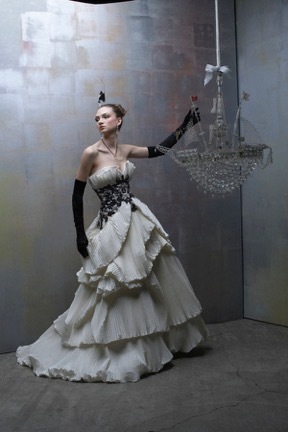 “Gloves add an old-world elegance to wedding attire. The question is, what’s appropriate and what’s not? Long gloves: For a longer, more formal dress, gloves of either elbow or opera length (above the elbow) give an elegant look. They draw attention to your arms, especially if your shoulders are bare and you have on a sleeveless dress or one with spaghetti straps. Opera-length gloves also provide warmth and flair if you’re having a winter wedding. Short gloves: These are great when wanting to create a subtler effect. For a summer garden wedding, short gloves lend a fresh and light flavor and give your gown a daintier, less formal look. If you have heavy arms, gloves will call attention to them, rather than camouflage them. If you have short arms but love the look of a long glove, choose an elbow-length pair rather than opera-length. Stay away from gloves that cut your upper arm at its heaviest point. Leather can be worn year-round, but save velvet gloves for winter. When wearing a suit jacket with a skirt or pants, gloves should be classic and simple. Forget wide cuffs and embellished trim. Short, wide kid gloves look best with suits. For answers to your most pressing questions while you plan your wedding, or to learn about the best styles for your body type, the bridal fitting process, and the do’s and don’ts to help you with every stage of your dream wedding, pick up Rani St. Pucchi’s #1 bestseller, Your Bridal Style: Everything You Need to Know to Design the Wedding of Your Dreams.